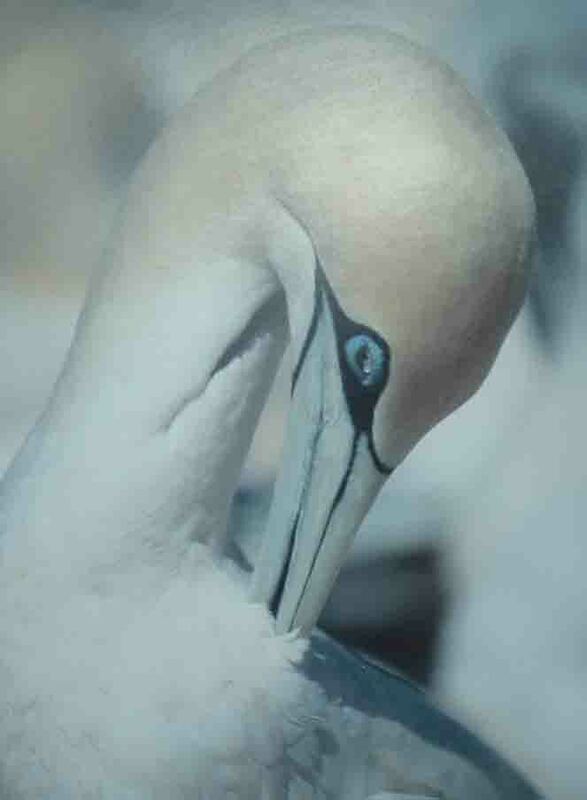 The Cape Gannet is a beautiful seabird which lives and breeds along the African coastline. It can be found from the Western Sahara coastline in the north round the southern shores of South Africa and as far north as the Gulf of Zanzibar (Tanzania) and Mombasa (Kenya)on the east coast. There are a number breeding grounds on the west coast with two of them near Cape Town, one near Lamberts bay called Bird Island, and the other, Malgas Island near Saldanha Bay. Birds hatched on the islands leave and return after three years to breed. The first bird to return is the male who after arrival seeks out a nesting spot for himself and his partner to be. When the females arrive the males through an intricate process have to impress the females. This is done by means of calling, head shaking and bowing. Once a mate has been found the pair first bond and then complete their nest of guano and other bits and pieces of rubbish before the female lays a single egg which is incubated by both partners.. The egg is incubated by the adults placing their webbed feet over the egg and keeping it warm. When the chick is ready to hatch it starts to piep in the egg. This is the signal for the egg to be moved onto the foot of the adult where it is kept warm in the feathers of the parent bird until it hatches. This is called brooding. After 42 to 46 days of incubation the egg hatches and a black and blind featherless chick sees the light of day. It rapidly gains weight and over the next three weeks it makes terrible demands on its parents. The chick feeds by pushing its beak into parents beaks from where food is regurgitated by the adults and transferred directly to the young chick's throat. Its hunger is insatiable. Once the chick has grown all its brown feathers it is ready to leave the nest. It wanders off down to the shoreline and there with all the other fledgelings will swim and follow the adults into the air down a runway used by the birds. This is a most risky period for the birds as they are attacked by seals who catch and eat them while they are swimming. Once the birds can fly they migrate northwards to the fishing grounds. Gannets are spectacular fishers diving from heights of thirty metres they enter the water with their wings closed and either grab an unsuspecting fish on their way down or on the way back to the surface. Fish caught are immediately swallowed so it is unlikely that you will see a surfacing bird with a fish in its beak. When there is a large shoal of fish about as there was at Cape Point the other day it was interesting to watch as the birds rained down on the sea like bombs and then surfaced, took off only to dive on the shoal again. The Cape coastline has many surprises for visitors who keep their eyes open when driving along it. There is however concern at the Lamberts Bay breeding colony . A seal population that was introduced to the area in 1965 has grown rapidly and is threatening the gannet population on the island. In fact it has become so dangerous for the gannets that they have left the colony altogether. Seals have become more vicious and don't only kill the gannets in the water but come ashore and raid the breeding grounds both in the day and at night. Reports state that about 8000 birds have been killed since 1998. The locals in Lamberts Bay are worried and plans are afoot to somehow protect the gannets from the seals. If the birds which are an important tourist attraction in the area should disappear so will the incomes of the locals as the fishing industry in the area has collapsed. We hope that a solution to the problem can be found.